H&M Has Finally Realized It’s 2013, Might Try This Whole “Online Store” Idea In U.S.
What’s a person to do when she needs an outfit for that one thing she’s going to but can’t possibly be bothered to go to a store? There’s this little thing called the Internet and online shopping, a phenomenon that thus far has appeared to stymie H&M’s efforts to join the rest of us here in 2013. 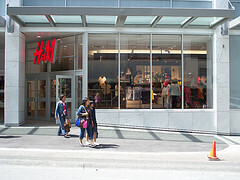 H&M (which stands for Hennes & Mauritz [the theater critics in the Muppet movies, right?]) has been peddling its wares online in Sweden for over 15 years. But there’s no such tool for American shoppers, unless the current rumors churning out of the mill are to believed. Businessweek is all abuzz with speculation that the Stockholm-based retailer is finally ready to make its debut in the U.S.’s online realm with an online store reportedly set to open in August — which starts this week. Things have changed since I first landed back on American soil, deflated to learn that there were no H&Ms to be seen until I moved to the East Coast. Now, there are over 300 stores across the country. Despite its expansion in recent years, there still are no locations in Montana, the Dakotas, Nebraska and 14 other states. Those poor people, right? Where do they buy their boyfriend style jeans and ballet flats?!? So there’s a demand here, for sure. But this move comes at a time when its rival Zara is walking all over the competition, seven years into its reign as Europe’s biggest apparel seller and two years since it opened its own online store for U.S. customers. It might take some effort for the retailer to build steam. Don’t be a tease, H&M. America has waited long enough for moderately priced pleather handbags and colorful cardigans.